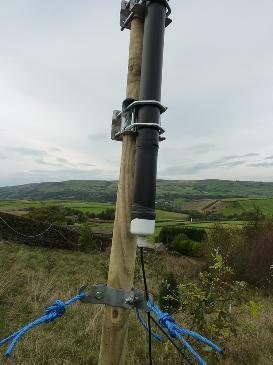 This is a 2.8m monopole electrode clamped to the top of a wooden post as in the adjacent photos. The pole is held upright by three ropes. The guy ropes are modelled as three separate wire electrodes so that they are brought out to separate terminals in the Spice model. In dry weather they are practically insulators and have no effect on the antenna but when soaked they act as grounded wires. Similarly the wooden support post becomes a conductor when wet, so this is represented in the model by a cylinder electrode. We want to calculate the effective height and corner frequency of the antenna when connected to a preamp with 100M input resistance. The input file monopole.in is listed below. Note the use of trig functions to position the guy wires at 120 degree intervals around the post. The layout expands to about 12,000 tiles so takes a few minutes to run. For comparison, a modified model is also shown which has the conducting guy wires and support post removed completely in order to represent perfect insulators in dry conditions. The corner frequency is about the same (50Hz) for wet and dry conditions, but the antenna effective height is affected. The antenna voltage above the corner frequency is 3.6V when dry and about 3.1V when wet. The incident field is 1V/m therefore these voltages directly give the effective antenna height. These models are very approximate because we have guessed values of the wet pole and guy resistances. 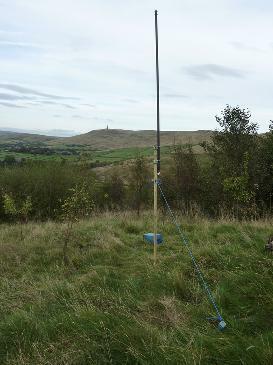 However it demonstrates that they have an effect and suggests it is desirable to use metal guy wires and support post, with the small cost of some effective height, so that the calibration of the antenna does not vary with the weather.